I've never ever seen so much buzz about a release of a new album. Ok, my streams aren't filled with information about Biebers and Gagas, so I can't tell what's happening there, but I'm sure Daft Punk won big time. The crazy release that's been going on for months, with teaser videos, song loops, weird promotions and shitloads of publicity. Facebook, Twitter or Reddit, Daft Punk seem to be all over the place, and everybody was trying to be the first to publish the link to the stream or download of Random Access Memories. The first single from the album already received more than 23 million views on YouTube (in 6 weeks), and the song is number 1 in many countries, besides breaking Spotify streaming records. What a comeback! Some of you may have heard about Arrested Development. It's one of those shows that got cancelled after only a few seasons, but kept a strong fan base that was waiting for years for a movie to be made. Then, the mighty Netflix came around, and something even better than a movie happened. Season 4, with the original cast! The trailer that launched a few days ago already has more than a million views, which is a lot compared to the 3.5 million who watched season 3 finale. Awesome stuff, can't wait to see it. A music album with lots of supporting content and infinite publicity, a TV show with a loyal army of geeks? These two cases are more alike than it seems at first sight. They both offer more than the content itself, they offer experiences. They are both fueled by the internet. They are both children of online virality. 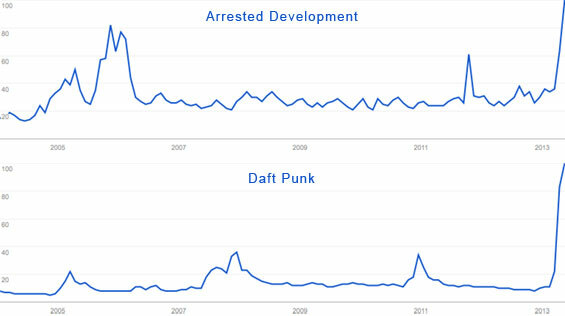 Google search trends for Daft Punk and Arrested Development peaked in the past days. Daft Punk gave us a something that goes beyond an album, they gave us a complete story that's funky, appealing and mysterious (and filled with 80s revival and robots). Netflix will be fulfilling a fantasy that we've been having for years, and they will make us come like never before. The complete season (15 parts, 8.5 hours) will be available at once, so fans will be able to watch it in one peace! The US internet will surely be consumed by Netflix on May 26th. Do you see what's happening? Everything, even (commercial) content, is becoming an experience. Otherwise, it's overlooked in the sea of information overload. UPDATE (16.6.2013): It seems Arrested Development's transmedia experience is getting more interesting. Yesterday evening, one of the most fascinating characters in the series, dr. Tobias Fünke, got it's own sizzle reel and website, promoting his acting skills. Great stuff. Twitter can be an extremely useful tool for promoting events. But you have to know what you're doing.